With the Nintendo Switch being the hot piece of kit that it is, it’s understandable that developers and publishers will want to bring their games to it and with Rising Star Games having so much to offer the console, today it is time to talk about Lumo. For the uninitiated, Lumo is described as being a game that is a “rebirth of the genre” as it is a “classic isometric adventure,” but is somewhat modernised as it has a modern twist that gamers of all ages can enjoy, so don’t let some of its kiddie appearances fool you, there is more to Lumo than meets the eyes. Especially since in is a game packed with so many puzzles that while half of them are a doodle to figure out, the rest will have you ripping your own hair out and resorting to go online to look for tips on videos by others to aid you. So yes, Lumo is not for the faint of heart as there are more than 400 rooms, four unique zones and a total of 6 mini-games that are so well hidden, you’ll be lucky to find half of them during your first playthrough because if you’re not taking the time to explore every nook and cranny of each room, then you will not find them and with so many things to collect, including four important Story related items, there really is a lot to discover. Gameplay-wise, if it wasn’t obvious, Lumo is a simple to play game that has you exploring rooms in a dungeon-crawler like manner (think The Binding of Isaac but nowhere near as deadly,) with very simple controls like using the Left analogue stick to move, – to bring up the map when you have it, + to access the game’s pause screen where saving your game can be done, once you have collected the Lumo book on the first floor and there’s also A which can be used for jumping. Only in order to jump, you will need to collect a certain power-up early on in the game to jump with some heigh. But the power-up is worth getting because if you hold the Jump button, you can rebound, which makes it easier to collect the toy ducks that are littered all over Lumo and can earn you 1 of the game’s 42 achievements. Jumping can also be used to make certain glowing boxes, disappear when you jump on top of them, and then jump again to create platforms, but be warned, one bad jump and a life can be lost. Yes it is all part of the fun and there really is quite a few things to look out for, but 400 rooms or not, Lumo is not all that big of a game, it is when playing Old School as losing all 3 lives will have you starting over and enduring everything again and again until you beat the game, or until you have earned every achievement going and set a decent time, but unless you are willing to invest the time into Lumo and play through it more than once, it can be something of a game you will pick up and play once before moving on to other things. It’s sad fact, but a true one nonetheless, although Lumo can be a fun game if you let and since it does let you choose the isometric directional input you desire before every playthrough, it is at least worth playing three times before giving up with it completely. So, is Lumo the “love letter to the golden age of gaming” it professes to be? In a single word, yeah. 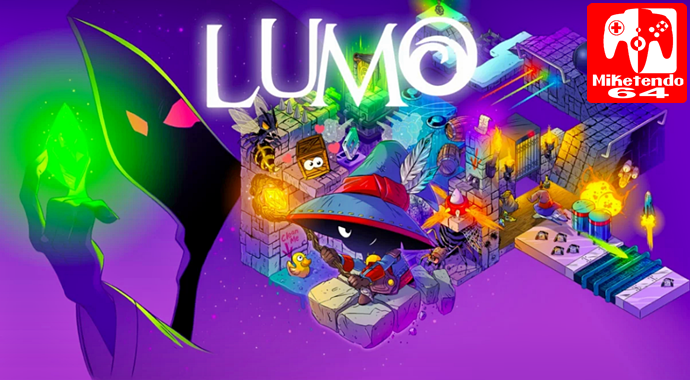 It does a great job of capturing the essence of certain games gone by and does a decent job of showing us all that isometric games still have a place in this world, especially on Switch, but Lumo is by no means the simple game it appears to be at first glance and while it does have a lot going on, ultimately its asking price is a tad too steep for the players who wish to take a punt on it. Tags: Nintendo Switch, November Feature, review, Rising Star Games, Spiral House, Triple Eh?